Hot, some may say steamy: the inside of a biogas digester is not a comfortable place to stay. Even worse I would suppose when actually in operation. Luckily I got a chance yesterday to see the inside during construction and speak with the team who have been contracted to build the digester at the Tithandizane Orphan Care Centre near Mchinji, Malawi. We were out viewing one of the MREAP Strategic Projects with Mzuni university who are delivering 10+ biogas plants nearby Mchinji. These biogas digester work, in short, through the decay of dung in a controlled environment, i.e. in a three cubic-metre tank buried in the ground. If managed properly produces methane. The dung comes from a minimum of 5 cows. A constant cycle of feeding is required with a 1:1 ratio of dung to water. Once a sufficient initial feed stock (several tons of dung!) is built up the system produces gas that gathers at the top of the digester, ready to be piped off and used for cooking. A digester this size is ideal for about 5 Malawian households, or, in this case, an orphanage. When we arrived on site we were immediate drawn to the partially built cylindrical structure set into a roughly 2.5 metre deep cavity in the ground. Scattered about the work site were 9 trainees assisting and learning on the job from the lead builder. 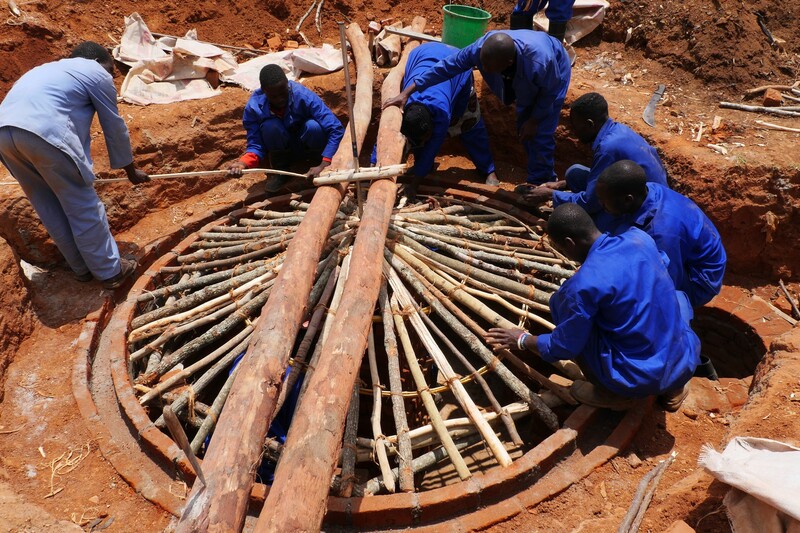 According to our colleagues at Mzuni the digester was about 80-90% complete; the next step being the construction of the dome. The foreman invited me to climb through what would be the exit for the spent feedstock – so (of course) I donned a hard hat and climbed in. While inside the foreman instructed the worker’s outside to put a cover over the temporary wooden roof braces in order to simulate what it is like to work inside when the dome is going up. Of course it was much darker and started to heat up – by design in fact, digestion speeds up at higher temperatures. The two trainees inside with me at the moment told me that they thought learning how to build biogas digesters were a good bet. Not only were some of the trainees planning to build digesters on their own land, but, saw the potential for further business should new digesters be required in the area or if maintenance is required. This was an added synergy to the project – not only will an orphanage’s cooking situation be improved, the the freshly trained construction workers will be able to work on or start new biogas projects nearby. Reblogged this on BioEnergy Consult Blog.